D1X-A3SS-UL This Explosion-Proof Barksdale Pressure Switch p/n D1X-A3SS-UL is a weld-sealed metal diaphragm, SINGLE setting, SPDT local mount 1/4 inch NPT Pressure Switch. This Pressure switch is rated for indoor or outdoor NEMA 4, 7 and 9 Explosion-Proof service. The D1XA3SS-UL has covered terminal strip and has a tamperproof external adjustment. Switch is rated 10 amps 120 or 240 VAC. Barksdale D1X-A3SS-UL SINGLE setting diaphragm explosion proof pressure switch. UL and CSA rated. D1X-H18SS-UL This Explosion-proof Barksdale Pressure Switch p/n D1X-H18SS-UL is a weld-sealed metal diaphragm, SINGLE setting, SPDT local mount 1/4 inch NPT Pressure Switch. This Pressure switch is rated for indoor or outdoor NEMA 4, 7 and 9 Explosion-Proof service. The D1XH18SS-UL has covered terminal strip and has a tamperproof external adjustment. Switch is rated 10 amps 120 or 240 VAC. Barksdale D1X-H18SS-UL SINGLE setting diaphragm explosion proof pressure switch. UL and CSA rated. D1X-A80SS-UL This Explosion-Proof Barksdale Pressure Switch p/n D1X-A80SS-UL is a weld-sealed metal diaphragm, SINGLE setting, SPDT local mount 1/4 inch NPT Pressure Switch. This Pressure switch is rated for indoor or outdoor NEMA 4, 7 and 9 Explosion-Proof service. The D1XA80SS-UL has covered terminal strip and has a tamperproof external adjustment. Switch is rated 10 amps 120 or 240 VAC. Barksdale D1X-A80SS-UL SINGLE setting diaphragm explosion proof pressure switch. UL and CSA rated. D1X-H150SS-UL This Explosion-proof Barksdale Pressure Switch p/n D1X-H150SS-UL is a weld-sealed metal diaphragm, SINGLE setting, SPDT local mount 1/4 inch NPT Pressure Switch. This Pressure switch is rated for indoor or outdoor NEMA 4, 7 and 9 Explosion-Proof service. The D1XH150SS-UL has covered terminal strip and has a tamperproof external adjustment. Switch is rated 10 amps 120 or 240 VAC. Barksdale D1X-H150SS-UL SINGLE setting diaphragm explosion proof pressure switch. UL and CSA rated. D2X-A3SS-UL This Explosion-Proof Barksdale Pressure Switch p/n D2X-A3SS-UL is a weld-sealed metal diaphragm, DUAL setting, SPDT local mount 1/4 inch NPT Pressure Switch. This Pressure switch is rated for indoor or outdoor NEMA 4, 7 and 9 Explosion-Proof service. The D2XA3SS-UL has covered terminal strip and has a tamperproof external adjustment. Switch is rated 10 amps 120 or 240 VAC. Barksdale D2X-A3SS-UL DUAL setting diaphragm explosion proof pressure switch. UL and CSA rated. D2X-H18SS-UL This Explosion-proof Barksdale Pressure Switch p/n D2X-H18SS-UL is a weld-sealed metal diaphragm, DUAL setting, SPDT local mount 1/4 inch NPT Pressure Switch. This Pressure switch is rated for indoor or outdoor NEMA 4, 7 and 9 Explosion-Proof service. The D2XH18SS-UL has covered terminal strip and has a tamperproof external adjustment. Switch is rated 10 amps 120 or 240 VAC. Barksdale D2X-H18SS-UL DUAL setting diaphragm explosion proof pressure switch. UL and CSA rated. D2X-A80SS-UL This Explosion-Proof Barksdale Pressure Switch p/n D2X-A80SS-UL is a weld-sealed metal diaphragm, DUAL setting, SPDT local mount 1/4 inch NPT Pressure Switch. This Pressure switch is rated for indoor or outdoor NEMA 4, 7 and 9 Explosion-Proof service. The D2XA80SS-UL has covered terminal strip and has a tamperproof external adjustment. Switch is rated 10 amps 120 or 240 VAC. Barksdale D2X-A80SS-UL DUAL setting diaphragm explosion proof pressure switch. UL and CSA rated. D2X-H150SS-UL This Explosion-proof Barksdale Pressure Switch p/n D2X-H150SS-UL is a weld-sealed metal diaphragm, DUAL setting, SPDT local mount 1/4 inch NPT Pressure Switch. This Pressure switch is rated for indoor or outdoor NEMA 4, 7 and 9 Explosion-Proof service. The D2XH150SS-UL has covered terminal strip and has a tamperproof external adjustment. Switch is rated 10 amps 120 or 240 VAC. Barksdale D2X-H150SS-UL DUAL setting diaphragm explosion proof pressure switch. UL and CSA rated. P1X-H30 This Explosion-proof BARKSDALE Pressure Switch p/n P1X-H30 is a Dia-Seal Piston pressure switch with BUNA-N diaphragm, SINGLE setting, SPDT local mount 1/4 inch Aluminum NPT Pressure Switch. This BARKSDALE Pressure switch is rated for indoor or outdoor NEMA 4, 7 and 9 Explosion-Proof service. The pressure range is .5 - 30 PSI with differential reset point .1 - 1.5 psi. The P1XH30 has screw terminals on snap action switch and has a tamperproof external adjustment. Snap Action switch is rated 10 amps 120 or 240 VAC. BARKSDALE P1X-H30 SINGLE setting dia-seal piston explosion proof pressure switch. UL and CSA rated. P1X-J30 This Explosion-proof BARKSDALE Pressure Switch p/n P1X-J30 is a Dia-Seal Piston pressure switch with BUNA-N diaphragm, SINGLE setting, SPDT local mount 1/4 inch Aluminum NPT Pressure Switch. This BARKSDALE Pressure switch is rated for indoor or outdoor NEMA 4, 7 and 9 Explosion-Proof service. The pressure range is .5 - 30 PSI with differential reset point .1 - 1.0 psi. The P1XJ30 has screw terminals on snap action switch and has a tamperproof external adjustment. Switch is rated 10 amps 120 or 240 VAC. BARKSDALE P1X-J30 SINGLE setting dia-seal piston explosion proof pressure switch. UL and CSA rated. P1X-M30 This Explosion-proof BARKSDALE Pressure Switch p/n P1X-M30 is a Dia-Seal Piston pressure switch with BUNA-N diaphragm, SINGLE setting, SPDT local mount 1/4 inch Aluminum NPT Pressure Switch. This BARKSDALE Pressure switch is rated for indoor or outdoor NEMA 4, 7 and 9 Explosion-Proof service. The pressure range is .5 - 30 PSI with differential reset point .1 - 1.0 psi. The P1XM30 has screw terminals on snap action switch and has a tamperproof external adjustment. Switch is rated 10 amps 120 or 240 VAC and .5 amps at 125 VDC. BARKSDALE P1X-M30 SINGLE setting dia-seal piston explosion proof pressure switch. UL and CSA rated. P1X-J30SS-V This Explosion-proof BARKSDALE Pressure Switch p/n P1X-J30SS-V is a Dia-Seal Piston pressure switch with VITON diaphragm, SINGLE setting, SPDT local mount 1/4 inch Stainless Steel NPT Pressure Switch. This BARKSDALE Pressure switch is rated for indoor or outdoor NEMA 4, 7 and 9 Explosion-Proof service. The pressure range is .5 - 30 PSI with differential reset point .1 - 1.5 psi. The P1XJ30SS-V has screw terminals on snap action switch and has a tamperproof external adjustment. Switch is rated 10 amps 120 or 240 VAC. BARKSDALE P1X-J30SS-V SINGLE setting dia-seal piston explosion proof pressure switch. UL and CSA rated. P1X-J85 This Explosion-proof BARKSDALE Pressure Switch p/n P1X-J85 is a Dia-Seal Piston pressure switch with BUNA-N diaphragm, SINGLE setting, SPDT local mount 1/4 inch Aluminum NPT Pressure Switch. This BARKSDALE Pressure switch is rated for indoor or outdoor NEMA 4, 7 and 9 Explosion-Proof service. The pressure range is 3-85 PSI with differential reset point .25 - 3.5 psi. The P1XJ85 has screw terminals on snap action switch and has a tamperproof external adjustment. Switch is rated 10 amps 120 or 240 VAC. BARKSDALE P1X-J85 SINGLE setting dia-seal piston explosion proof pressure switch. UL and CSA rated. P1X-M85 This Explosion-proof BARKSDALE Pressure Switch p/n P1X-M85 is a Dia-Seal Piston pressure switch with BUNA-N diaphragm, SINGLE setting, SPDT local mount 1/4 inch Aluminum NPT Pressure Switch. This BARKSDALE Pressure switch is rated for indoor or outdoor NEMA 4, 7 and 9 Explosion-Proof service. The pressure range is 3-85 PSI with differential reset point .25 - 3.5 psi. The P1XM85 has screw terminals on snap action switch and has a tamperproof external adjustment. Switch is rated 10 amps 120 or 240 VAC and .5 amps at 125 VDC.BARKSDALE P1X-M85 SINGLE setting dia-seal piston explosion proof pressure switch. UL and CSA rated. P1X-J85SS-V This Explosion-proof BARKSDALE Pressure Switch p/n P1X-J85SS-V is a Dia-Seal Piston pressure switch with VITON diaphragm, SINGLE setting, SPDT local mount 1/4 inch Stainless Steel NPT Pressure Switch. This BARKSDALE Pressure switch is rated for indoor or outdoor NEMA 4, 7 and 9 Explosion-Proof service. The pressure range is 3-85 PSI with differential reset point .25 - 3.5 psi. The P1XJ85SS-V has screw terminals on snap action switch and has a tamperproof external adjustment. Switch is rated 10 amps 120 or 240 VAC. BARKSDALE P1X-J85SS-V SINGLE setting dia-seal piston explosion proof pressure switch. UL and CSA rated. P1X-J340 This Explosion-proof BARKSDALE Pressure Switch p/n P1X-J340 is a Dia-Seal Piston pressure switch with BUNA-N diaphragm, SINGLE setting, SPDT local mount 1/4 inch Aluminum NPT Pressure Switch. 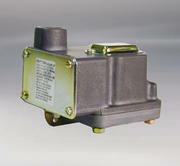 This BARKSDALE Pressure switch is rated for indoor or outdoor NEMA 4, 7 and 9 Explosion-Proof service. The pressure range is 6-340 PSI with differential reset point 1 - 8.5 psi. The P1XJ340 has screw terminals on snap action switch and has a tamperproof external adjustment. Switch is rated 10 amps 120 or 240 VAC. BARKSDALE P1X-J340 SINGLE setting dia-seal piston explosion proof pressure switch. UL and CSA rated. P1X-M340 This Explosion-proof BARKSDALE Pressure Switch p/n P1X-M340 is a Dia-Seal Piston pressure switch with BUNA-N diaphragm, SINGLE setting, SPDT local mount 1/4 inch Aluminum NPT Pressure Switch. This BARKSDALE Pressure switch is rated for indoor or outdoor NEMA 4, 7 and 9 Explosion-Proof service. The pressure range is 6-340 PSI with differential reset point 1 - 8.5 psi. The P1XM340 has screw terminals on snap action switch and has a tamperproof external adjustment. Switch is rated 10 amps 120 or 240 VAC or .5 amps @ 125VDC. BARKSDALE P1X-M340 SINGLE setting dia-seal piston explosion proof pressure switch. UL and CSA rated. P1X-J340SS-V This Explosion-proof BARKSDALE Pressure Switch p/n P1X-J340SS-V is a Dia-Seal Piston pressure switch with VITON diaphragm, SINGLE setting, SPDT local mount 1/4 inch Stainless Steel NPT Pressure Switch. This BARKSDALE Pressure switch is rated for indoor or outdoor NEMA 4, 7 and 9 Explosion-Proof service. The pressure range is 6-340 PSI with differential reset point 1 - 8.5 psi. The P1XJ340SS-V has screw terminals on snap action switch and has a tamperproof external adjustment. Switch is rated 10 amps 120 or 240 VAC. BARKSDALE P1X-J340SS-V SINGLE setting dia-seal piston explosion proof pressure switch. UL and CSA rated. P1X-J600 This Explosion-proof BARKSDALE Pressure Switch p/n P1X-J600 is a Dia-Seal Piston pressure switch with BUNA-N diaphragm, SINGLE setting, SPDT local mount 1/4 inch Aluminum NPT Pressure Switch. This BARKSDALE Pressure switch is rated for indoor or outdoor NEMA 4, 7 and 9 Explosion-Proof service. The pressure range is 25-600 PSI with differential reset point 2.0 - 19 psi. The P1XJ600 has screw terminals on snap action switch and has a tamperproof external adjustment. Switch is rated 10 amps 120 or 240 VAC. BARKSDALE P1X-J600 SINGLE setting dia-seal piston explosion proof pressure switch. UL and CSA rated. P1X-M600 This Explosion-proof BARKSDALE Pressure Switch p/n P1X-M600 is a Dia-Seal Piston pressure switch with BUNA-N diaphragm, SINGLE setting, SPDT local mount 1/4 inch Aluminum NPT Pressure Switch. This BARKSDALE Pressure switch is rated for indoor or outdoor NEMA 4, 7 and 9 Explosion-Proof service. The pressure range is 25-600 PSI with differential reset point 2.0 - 19 psi. The P1XM600 has screw terminals on snap action switch and has a tamperproof external adjustment. Switch is rated 10 amps 120 or 240 VAC or .5 amps @ 125 VDC. BARKSDALE P1X-M600 SINGLE setting dia-seal piston explosion proof pressure switch. UL and CSA rated. P1X-J600SS-V This Explosion-proof BARKSDALE Pressure Switch p/n P1X-J600SS-V is a Dia-Seal Piston pressure switch with VITON diaphragm, SINGLE setting, SPDT local mount 1/4 inch Stainless Steel NPT Pressure Switch. 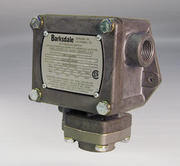 This BARKSDALE Pressure switch is rated for indoor or outdoor NEMA 4, 7 and 9 Explosion-Proof service. The pressure range is 25-600 PSI with differential reset point 2.0 - 19 psi. The P1XJ600SS-V has screw terminals on snap action switch and has a tamperproof external adjustment. Switch is rated 10 amps 120 or 240 VAC. BARKSDALE P1X-J600SS-V SINGLE setting dia-seal piston explosion proof pressure switch. UL and CSA rated. P1X-J1600 This Explosion-proof BARKSDALE Pressure Switch p/n P1X-J1600 is a Dia-Seal Piston pressure switch with BUNA-N diaphragm, SINGLE setting, SPDT local mount 1/4 inch Aluminum NPT Pressure Switch. This BARKSDALE Pressure switch is rated for indoor or outdoor NEMA 4, 7 and 9 Explosion-Proof service. The pressure range is 400-1600 PSI with differential reset point 20 - 80 psi. The P1XJ1600 has screw terminals on snap action switch and has a tamperproof external adjustment. Switch is rated 10 amps 120 or 240 VAC. BARKSDALE P1X-J1600 SINGLE setting dia-seal piston explosion proof pressure switch. UL and CSA rated. P1X-J1600SS-V This Explosion-proof BARKSDALE Pressure Switch p/n P1X-J1600SS-V is a Dia-Seal Piston pressure switch with VITON diaphragm, SINGLE setting, SPDT local mount 1/4 inch Stainless Steel NPT Pressure Switch. 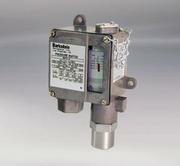 This BARKSDALE Pressure switch is rated for indoor or outdoor NEMA 4, 7 and 9 Explosion-Proof service. The pressure range is 400-1600 PSI with differential reset point 20 - 80 psi. The P1XJ1600SS-V has screw terminals on snap action switch and has a tamperproof external adjustment. Switch is rated 10 amps 120 or 240 VAC. BARKSDALE P1X-J1600SS-V SINGLE setting dia-seal piston explosion proof pressure switch. UL and CSA rated. Throughout the world, Barksdale components can be found in steel mills, on machine tools, in auto plants, in power generation and distribution facilities, in chemical processing plants, in pulp and paper mills, textile mills, amusement parks, and food processing plants, on offshore drilling rigs, in oil and natural gas fields, rescue equipment, and on many forms of transportation equipment, both on- and off-road. Many industries use a variety of Barksdale's product lines. E.g. in mobile- and stationary hydraulic systems: from hydraulic clamping in machine tooling, hydraulic steering systems off highway loaders or load monitoring on crane support struts to vertical cargo lifts and elevators. In almost every industry, Barksdale products are at work, helping to build a better tomorrow. Barksdale's 9617 Series Sealed Piston Pressure Switches offer extremely long life in a robust package, making them the ideal solution to your industrial pressure control needs. Sealed Piston Pressure Switches are ideal for applications demanding rapid cycling at high pressure. 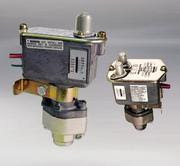 Available in various pressure ranges up to 7500 psi, sealed piston switches are suitable for use in industrial applications such as hydraulic presses, compactors, and machine tools. All models feature a durable, anodized aluminum enclosure with a tamper proof adjustment screw cover and an integrated 1/2" NPT conduit connector, and are rated to NEMA 4 as a standard. A clear cover allows easy viewing of the calibrated adjustment scale. For applications requiring a highly accurate switch in a durable package, Barksdale's 9617 Series Sealed Piston Pressure Switches are the ideal choice. Barksdale's Series 9675 & A9675 Sealed Piston Pressure Switches offer extremely long life in a robust package, making them the ideal solution to your industrial pressure control needs. Sealed Piston switches are ideal for applications demanding rapid cycling at high pressure. Available in various pressure ranges up to 6000 psi, sealed piston switches are suitable for use in industrial applications such as hydraulic presses, compactors, and machine tools. All models feature a durable, anodized aluminum enclosure with a tamper proof adjustment screw cover and an integrated 1/2" NPT conduit connector, and are rated to NEMA 13 as a standard. For applications requiring a highly accurate switch in a durable package, Barksdale's Series 9675 & A9675 Sealed Piston Pressure Switches are the ideal choice. Barksdale's Series C9612 and C9622 Sealed Piston Pressure Switches offer extremely long life in a robust package, making them the ideal solution to your industrial pressure control needs. Sealed Piston switches are ideal for applications demanding rapid cycling. Available in various pressure ranges from 15 to 3000 psi, sealed piston switches are suitable for use in industrial applications such as hydraulic presses, compactors, and machine tools. All models feature a durable, anodized aluminum enclosure with a tamper proof adjustment screw cover and an integrated 27/32" hole for 1/2" NPT conduit connector, and are rated to NEMA 3 as a standard. Optional terminal boxes allow for ease of electrical connection, and switches are available in both single and dual circuit configurations. For applications requiring a highly accurate switch in a durable package, Barksdale's Series C9612 and C9622 Sealed Piston Pressure Switches are the ideal choice. Barksdale's Series 9048 Sealed Piston Pressure Switches offer extremely long life in a robust package, making them the ideal solution to your industrial pressure control needs. Sealed Piston switches are ideal for applications demanding rapid cycling at high pressure. Available in various pressure ranges up to 12,000 psi, piston switches are suitable for use in industrial applications such as hydraulic presses, compactors, and machine tools. All models feature a durable, anodized aluminum enclosure with an integrated ½" NPS conduit connector, a tamper-resistant setpoint adjustment screw, and are rated to NEMA 13 as a standard. An optional terminal box with built-in conduit connector simplifies wiring connections. For applications requiring a highly accurate switch in a durable package, Barksdale's Series 9048 Sealed Piston Pressure Switches are the ideal choice.